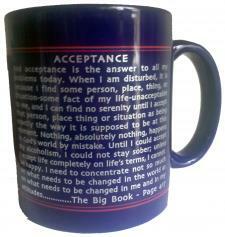 ...And Acceptance IS The Answer To A Truly Great Coffee Mug. Perfect To Accept A Delicious Cup Of 'Club Coffee'. This Is A Cobalt Blue Mug With Royal Blue Trim and Handle, & White Print. Copied Just Like Dr. Paul Wrote It.